Many collectors enjoy building sets of American Silver Eagles, a one-ounce bullion coin that has become one of the most popular in the world. The first American Silver Eagle coins were released in 1986 as bullion and proof specimens. While the bullion silver eagles are primarily sold to precious metals investors, the proofs have always been marketed to coin collectors. While some silver stackers may scoff at paying anything over bare minimum on the spot price for American Silver Eagles, the truth is this silver bullion coin series offers some of the most beautiful coins the United States Mint produces today. The obverse design of the American Silver Eagle revives Adolph A. Weinman's Walking Liberty motif seen on the half dollar from 1916 through 1947 consistently ranks among numismatists as one of the most beautiful silver coin designs ever created. Among bullion coins, proof American Silver Eagles are aesthetically superior to just about any other silver coin in production today. This is one reason collectors enjoy assembling sets of these large silver proof coins. However, collecting American Silver Eagles isn't without its challenges. What is one of the biggest? Perhaps it's the fact that assembling a complete date run going back to the inception of the series in 1986 is impossible. Why? 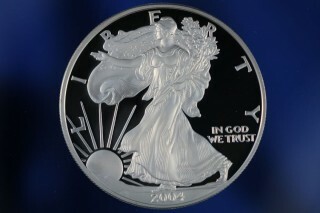 A shortage of silver planchets in 2009 essentially forced the Mint to withhold production of proof silver eagles that year. The absence of 2009 proof American Silver Eagles is understandably frustrating for many coin collectors, but it's an issue that hobbyists must cope with if they're going to enjoy collecting this popular modern series. Though not literally impossible for any collector to obtain, the 1995-W American Silver Eagle, which serves as the key to series, may seem impossible for some hobbyists to collect. It was struck in very limited quantities and was included in that year's special 10th anniversary American Eagle coin set, which also encompasses the four gold coins of the bullion series, including the tenth-ounce, quarter-ounce, half-ounce, and one-ounce gold coins. The 1995-W American Silver Eagle has a mintage of just 30,125 pieces and often retails for more than $3,500. Other expensive proof American silver Eagles include the various reverse proof issues that have been sold on an occasional basis since 2006. These generally range in price from about $80 to $250, depending on the individual year of issue. Collecting proof American Silver Eagles is not cheap, but it's a great goal for those who appreciate modern coins and enjoy this popular bullion series. This year's current proof American Silver Eagles can be bought directly from the United States Mint, while older issues are widely offered by coin dealers. Why Do People Still Clean Their Coins? Joshua McMorrow-Hernandez is a freelance writer and author who has contributed hundreds of online articles and blog posts, as well as published Images of America, Tampa’s Carrollwood (Arcadia Publishing, 2013). Joshua is interested in a wide array of topics, and since 1992 has been heavily involved in numismatics, a topic about which he loves to research and write. His main area of focus is 19th and 20th century United States coins, but he also enjoys Canadian coins.